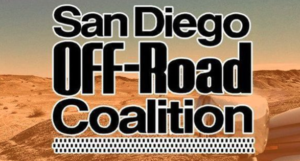 March 16, 2016—For the last year, SDORC has been following an action by the Cleveland National Forest to close a variety of routes found on the ground that are not in the forest inventory. Last December we discovered the forest is including Carveacre Road, as it believes it needs to be closed to protect resources. The process taken by the forest has a few points where comments are taken from the public. SDORC has commented each time and now the final plan has been published, with Craveacre still being slated for closure. The last action we can take in this process is called an Objection. The Objection period ends March 28th and SDORC will submit an Objection by then. SDORC has given the Forest a Freedom of Information Act request for data on why Carveacre Road needs to be closed. Stand by for news from our Objection.